to a marine platoon. He lost his life on February 3, 1968. Below is a letter that I received after posting a tribute to Richard on "The Wall" web site. Roger, whom I did not know, saw my message and sent me the following letter. I hope that Roger accepts this as a memorial not only to Richard, but to himself and all others who participated in the Vietnam Conflict. My name is Roger Lansbury. I was recently informed of the “Wall Web Page”. The first thing I did when I found this web site was look up Richard Stanton. There I found your name and beautiful words. A dream of mine has been answered. I had always hoped that one day I might run across family or friends of Richard's. Richard and I were fellow Corpsmen with the 2nd platoon “E” Company, 2nd Battalion, 5th Marines, 1st Marines Division in An Hoa `thei Phu Bai', Republic of Vietnam, in 1967 and 1968. 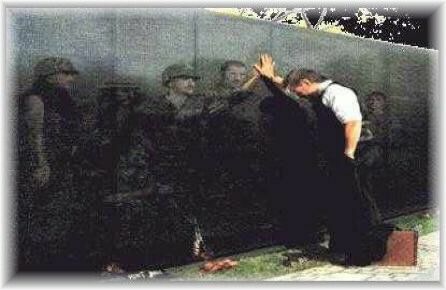 I was the only corpsman with the platoon for several months until Richard arrived in `country'. He and I then made up a full compliment of corpsmen for the platoon. I sort of trained and broke Richard in to being a line company combat corpsman. 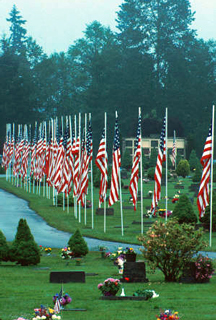 We went with the marines and lived with them and did everything they did: patrols, ambushes, “sweeps”, operations, etc. The only differences from us, and the marines were that Richard and I did not carry rifles. We could have, to help disguise our function, but we choose not to. When the bullets started flying and the mortars dropping, and everyone else hit the deck, that was usually about the time for us to get up to go to the aid of a wounded comrade. The cry, “Corpsman Up” was our call to action. I sort of broke Richard in to the field. I sort of trained him and I have always felt a bit guilty that I may have “trained” him too well. In my eyes Richard was a hero. I was not with him when he died, but I have spoken with a squad leader who was. He died at a place called Troi River Bridge. It was the start of the 1968 Tet Offensive and “E” Co. was working the area of the Rock Crusher and the railroad tunnel outside of Phu Bai. 2nd platoon was badly ambushed at the village at Troi River Bridge. Under enemy fire, Richard went to the aid of a downed marine who had been killed. Even though the squad leader told Richard, as he was passing by, that the marine was dead, I guess Richard had to make sure for himself, so he continued to the side of the man. He did find him dead, and as he turned to return to the main group of pinned down marines, he was shot and killed instantly. Had I trained him too well? I had once accused him of not caring about his job. In this case, maybe he cared too much. Intellectually, I am aware I was not responsible for his death. Emotionally, I still felt some responsibility for his death. He was at first my trainee, and then soon my peer. I was not even with the platoon when he died. I had been reassigned to the Battalion Aid Station. Richard was a hero! He cared deeply for the men under his charge. He was responsible for their general health and welfare, and was well respected by the men. He went unhesitantly and unselfishly to the aid of a fallen comrade and paid with his life. I do know that he survives in another world beyond this where there is no horror, fear, pain or suffering. He also remains very much alive in my heart for the rest of my days on this earth. I am honored to have served with him. I'm glad to have found you. I hope these words are in some way a comfort for your loss. If there is surviving family, and you think it appropriate, maybe they would like to see this letter. He had a girl friend in Japan. If you are in touch with her, she too may be interested. Thank you for your words on the “Wall Web Page”. Thank you for giving me the opportunity to tell my story to someone who was close to Richard outside of his military life. Richard remains a role model and inspiration for my life. P.S. This is a photo of me (with mustache) and Richard and our squad from the 2nd platoon in back of us. 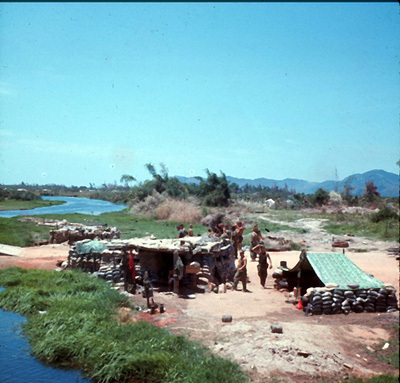 It was taken in 1967 in the village at one of our outposts called Nong Son. Today, November 23, 2007 I made contact with a fellow serviceman, Larry Hunt. Larry had left a message on my guess book. He was a member of H 2/5 and was also at the Troi Bridge just before Richard Stanton arrived there. He provided me with the pictures below as he saw the area at that time. 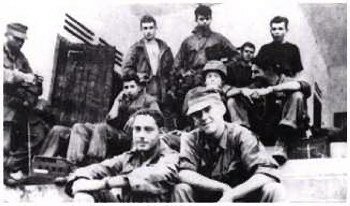 Dave, I read your dedication on your site and realized that Richard Stanton and the men of E 2/5 were the men that relieved us at the Troi River Bridge at the beginning of the 1968 Tet Offensive. Being a member of H 2/5 at the beginning of Tet, we were called north to Hue City. 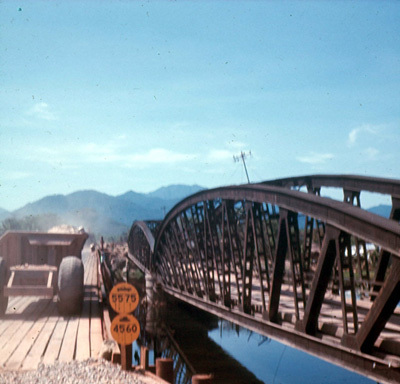 After Tet wound down, we were providing convey security between Danang and Phu Bai and passed over the Troi Bridge quite a few times. 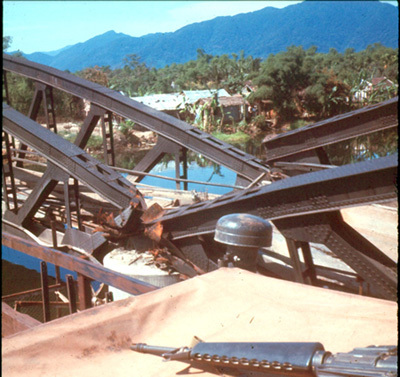 In fact, I have a few photos of the destroyed bridge which were taken from the new timber bridge built by the Seabees. We had heard of the bridge being over-run shortly after we were relieved. We knew of the many men lost there, and at the time the only thought was that it wasn't us. The black line stretches beyond belief,Veterans come to heal unconsoled grief. Eight Daughters sacrificed and all the rest Sons. For what did they die, these precious souls gone? Future's golden promise now tragically ends.